There is a number of possible revenue streams for Webmasters offered by Swap Factory: Pay per Listing, Pay per Contact, Pay per Image, Pay for featured ads. Buy Credits item, which can offer attractive discounts for users. While Swap Factory provides ways for users to contact each other, transactions made between them are not handled by the extension or supported by it directly. The available payments gateways being used for the listing, images, or other payment plugins. There are several Payment Gateways which are shipped with the standard version. 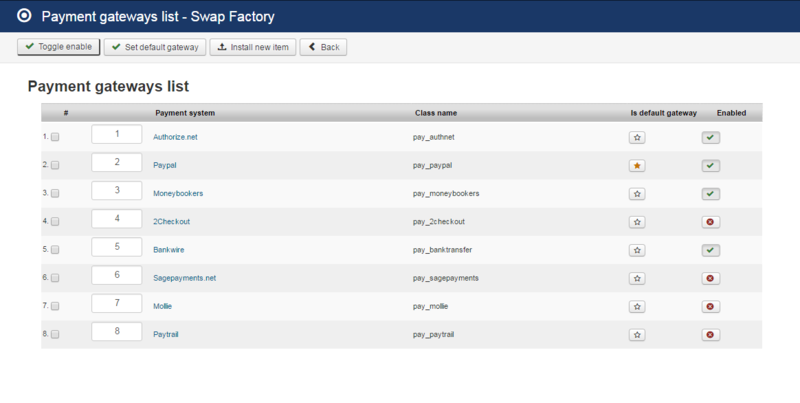 Swap Factory installs with multiple Payment Gateways which can be used to pay certain Payment Items. Along this, you will need to add your PayPal Email address and to choose if you wish to auto accept the valid payments. Below you can enable the Test mode of the gateway. Using this setting all sales will be treated as testing, regardless of any parameter value. Payment Items page allows you to manage all the available revenue streams of the component. To enable or disable any of these items, click on the symbols in the upper right corner of each item. A pop-up should appear with "Click to disable" or "Click to enable" when hovering over the icon. This item is available so that you can create Credit Offers giving your users a discount in order for them to receive a set amount of extra credit. These offers can be seen on the frontend on the Profile page of the user menu under the Credits offer tab. On the Add credit area you have to add a name for the new offer and how many funds will the user receive for it. Afterward, select the price that the user has to pay. Preferential prices can be added for Powersellers and Verified Users. Click on the Save button found at the top of the page when you are done. All the offers should be seen on the Credits list area. There you can edit, delete or change their order. You can make advantageous offers giving users the chance with these "3 in 1" packages to pay less than if they would buy them separately. All the packages can be seen on the Profile page of the user menu under the Packages offers tab. On the left side of the page, you will find a form where you can add details for the new package. First, add a name and the availability period(in days) of it. 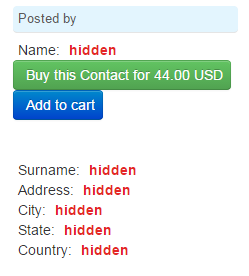 Second, add how many listings, images and contact details are allowed for the user who buys the package. You can select just some of them or add them with unlimited amounts. Furthermore, add the price that the user has to pay. Preferential prices can be added for Powersellers and Verified Users. Click on the Save button found at the top of the page when you are done. The Pay per Listing item will allow you to request a defined price for every newly posted ad. In case the poster doesn't have the required amount in his balance, the ad will be set as Unpublished and a payment of that value will be added on pending with the user being redirected to a payment form for buying the required credit for the ad in question. When the poster is charged and the payment is completed, his ad will become Published and accessible by other users. In case you enabled and set availability periods for listings, users will get to choose, instead of a starting and ending date, the availability period wanted for the new add, with information about the cost next to it. 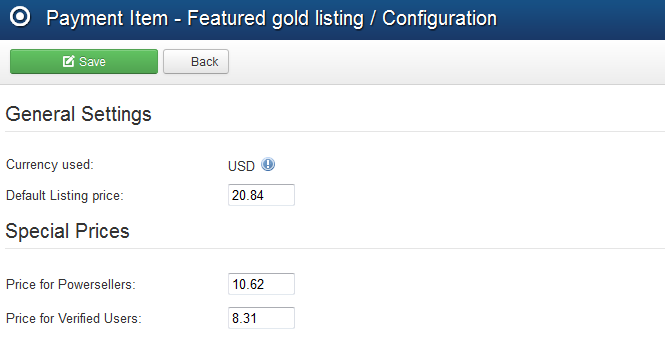 From the backend, you can set the Default Listing Price that users will have to pay to have their ad published. The used currency will always be, as default, the one set on the Settings/Currency Manager page. Preferential prices can also be added here for Powersellers and Verified Users. Set the Default image price for each uploaded image. 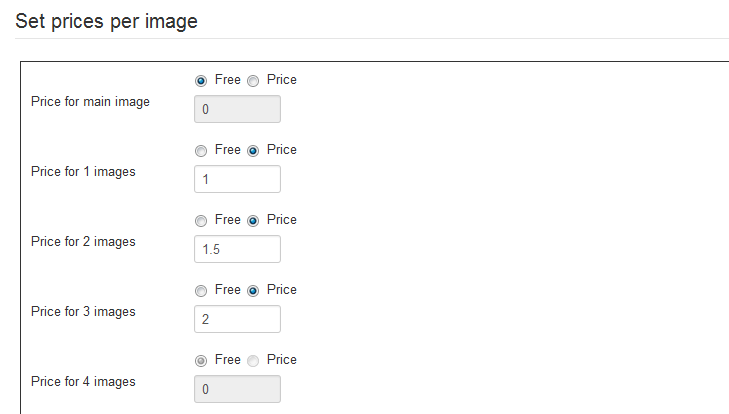 To set all images free, you simply have to disable the image payment item. Preferential prices can be added for Powersellers and Verified Users. 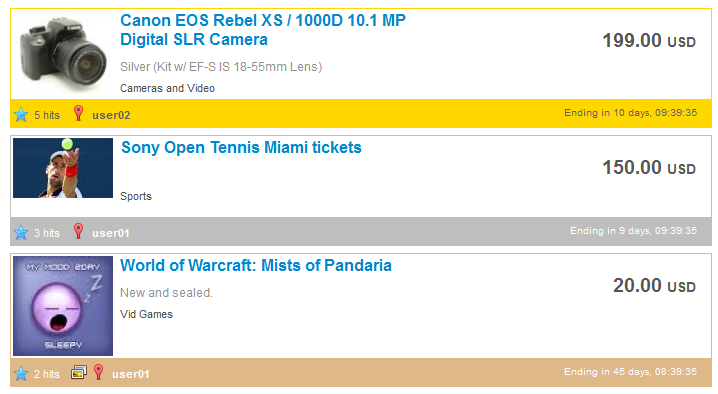 The pricing can also be set individually for the main image, first image, second image and so on. This will overwrite the default pricing or the preferential pricing for special ranks of users that can be set above. Enabling Pay per Contact you will hide users' details from each other, forcing them to pay a defined price to reveal those details. Contact buying is the same as for every credit buying. In case you don't have the required amount of funds in balance, you will be redirected to the buying form where you choose to buy credits to view hidden profile info. 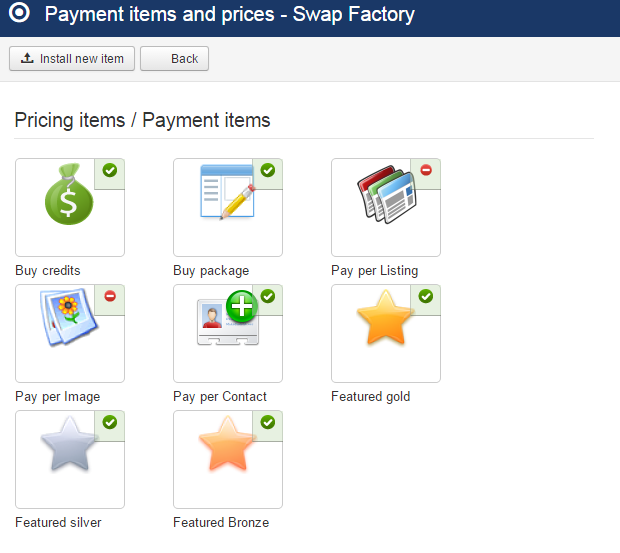 As a new feature for Swap Factory, users can place multiple payment items on cart (Credits offers, Packages, Pay per Featured, Pay per Contact and Add Balance) with the Add to cart button, allowing them to buy all of them at once. This feature is not available in CB because Community Builder displays the profile of a user by itself, and only setting up restrictions of privacy directly in CB can prevent hiding the user details in case of an active CB. 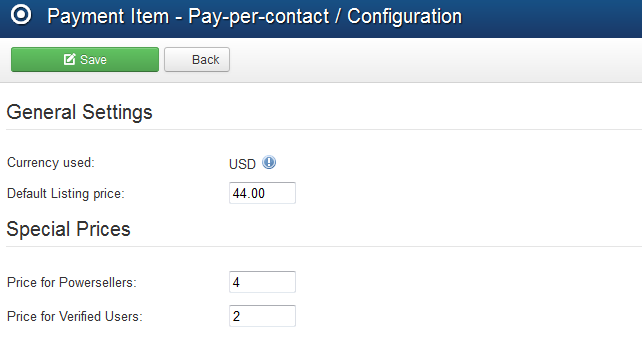 From the backend, you can set up for this feature the Default price for displaying the contact info. The used currency will always be, as default, the one set on the Settings/Currency Manager page. Preferential prices for Verified Users and Powersellers can also be set here. The Featured Gold, Silver and Bronze items adds ads on top of the lists and with different, more visible templating systems. Sorting order with these items enabled will be Featured Gold > Featured Silver > Featured Bronze > Normal ads. Amongst the same type of featured, regular sorting applies. When promoting your ad to Featured, the amount of credit needed will be "consumed" from your balance. Else you will be redirected to a payment form for buying the required credit for the ad in question. When the user part of the payment is done, PayPal will send an IPN notification to the site with the payment information and status. The IPN will arrive if the payment is valid, directly accepted if the buyer's PayPal account is trusted or manually accepted. In the latter case, the payment must be approved by the webmaster and only after this, the credit will be available to the buyer's account.